On Friday, out for a fish and chips at Aunty B’s we notice out the window and down the street a small murder of crows having as great time in a tall tree. The wind was howling. It was March 14, 2014 at 6:40 pm and a single maple tree contained 15-20 crows are swinging in the wind. Crow-ology Why do crows like being up in tall trees during a strong wind? It was still sunny at the tree top, this tall, thin maple was sort of in the lea side of a large pine. Both trees were swinging in the wind. The crows faced the wind, bobbing around for over an hour as the sun set. The crows were enjoying a ride on the maple or why were they up there? 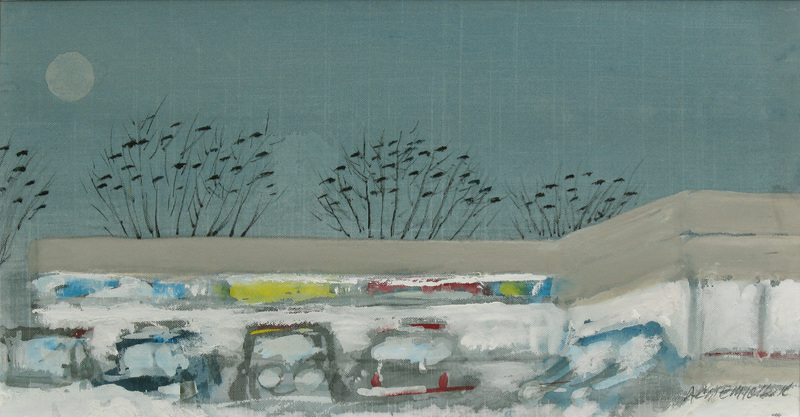 This painting is from a few years ago on the same theme and is titled: December 30, 2009 5:35pm. We recently purchased a print 8 of 20 1979 titled temptations of Pope John Paul. It has sparked many conversations as to the meaning of this painting. What is your interpretation of this piece? My wife see’s a cross, a deer, a rabbit and snakes in the grass and the face of Jesus?